With all that is happening right now in the media we do not know who to believe anymore; some people have lost a lot of their credibility in my eyes. What about you, is there someone you don’t quite trust? Or on the other side, is there someone who might not trust you totally? The last few weeks have been filled with news and examples of behaviors that bring doubts, harm, or worse, destroy someone’s credibility. These examples inspired me this month’s article. Often despite our best intentions, we are victims of our own lack of judgment or our desire to look good. And in doing so, without always realizing it, we behave in ways that do not quite reflect our best intentions. To bring them to our attention, here are five of the many behaviors that can cause doubts or distrust among your employees, colleagues, bosses, and even your family, and destroy your credibility. 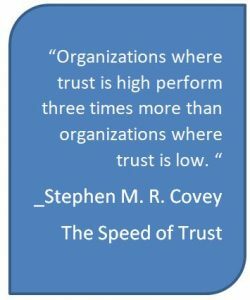 I tried to avoid talking about the obvious ones like lying, taking all the credit, and other such approaches that affect trust. Do you tend to sweep the problems under the carpet hoping that time will make things right? Does this attitude cause you to deal with all kinds of small tasks or small difficulties and ignore the REAL problems? Recently one of my colleagues was courageous enough to approach me with a problem my group had caused. The good thing is that we were able to clarify the situation and take away an extremely important lesson for our next events. It was positive for both of us and our client. But why are we sometimes hesitant to confront reality? It could be the fear of the other person’s reaction, or the uncertainty about the outcome that talk could generate. If you are hesitant to deal with some problems, explore your feelings and see what might be your obstacle. Think about the consequences for you and others to not confront the problem; it could be worse. Have you ever listened to someone speak and find yourself doubting his/her words? What could cause this? Is it possible that his/her words are accurate but that his/her expression demonstrates the opposite; or on the contrary, his/her expression (non-verbal language) is accurate and his/her words are not? An example would be when a person tells you that they like the muffins you bring to the office on Friday morning, but that their expression is one of near-disgust. What will you believe; the words or the expression? It is well know that in general, the body does not lie. The body has this extraordinary talent to express our real feelings without us even realizing it. The next time that you happen to doubt the authenticity of someone’s words, observe their non-verbal and if the words and the expression do not match, then ask questions to clarify your understanding. In doing so, you will eliminate unnecessary doubts, you will help the other by pointing out this fact, and most of all it will make you aware of your own non-verbal. When your words are congruent with the expression and tone of your voice, you are taken more seriously. Blaming others, is avoiding to acknowledge responsibility for the results of a situation or not recognizing one’s own contribution to an unwanted result, e.g. : “It’s not my fault, everyone handed me their document too late!” To which I could I ask myself: “What did I do (or not do) as a follow-up to retrieve the documents on time?” Or did I go to see my boss to negotiate a new deadline when I realized I would be late? In short, when I commit to do something and I do everything in my power to accomplish my task, I do not need to blame myself. Instead I can use the situation as an opportunity to learn by asking myself how I could handle a similar situation in the future and thus help to improve the results. Think about it, if you are a team leader and you tell your boss “it’s not my fault, my staff handed me their document late!”, do you think you have you just raised your credibility in the eyes of your boss? In the eyes of your employees? Think twice. Keeping one’s commitments is one of the most important behaviors when it comes to building trust in a relationship. Whether it’s our employees, our colleagues, our customers, our life partner, our children, breaking our commitments will definitely impact the relationship. 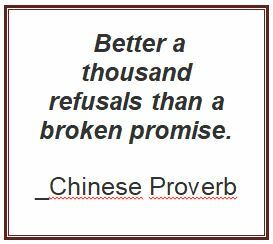 When you answer yes to people’s requests or make promises you do not particularly want to do and then you don’t deliver, or you cancel, you quickly impact and destroy the trust people have in you and it can be difficult to rebuild. Sometimes breaking commitments stems from our difficulty in saying no to someone for fear of disappointing them, or being perceived as a poor collaborator, or because our desire to help is too strong. Next time someone asks you something, take a moment to think about the request and determine if you have the time, resources, and abilities to commit to it. This way you can define more precisely the extent of your commitment. Nobody likes to be wrong, or worse being told they are wrong. But refusing to admit an error is refusing to learn and improve. It’s also neglecting the most important element: to fix your mistakes. It’s a bit like telling the other person “it’s not really my problem…”. And this kind of behavior will weaken the relationship. When my colleague told me about the mistake made by our group, the first question I asked her was “how can we fix this situation with our client?” Not only does the fact of dealing with the problem (not ignoring it) has been beneficial to our relationship, but accepting our mistake and fixing it with the client will have increased our credibility with this client. These examples of behaviors that destroy credibility are just a few examples. In all these examples, there is a common message that will make you a credible person, with whom people will be happy to work and exchange: BE AUTHENTIC!